Search marketers are using social media to improve their own SEO. SEOs are using various social media channels to improve the visibility of their content. SEOs and PR experts have typically been on the leading edge of content marketing. Creating content people want to intake is part of the equation. Finding the right channels to promote your content is another. Search marketers, business leaders, and individuals looking to self-promote are still turning to social media is growing numbers. Fresh content is an important part of an SEO strategy and most social media sites allow people to share continuous content with numerous individuals. More than fifty percent of companies have used a blog to improve SEO. While search marketers also use plenty of nonsocial techniques to gain stature on engines like Google and Bing, several popular tactics have a social basis. Nearly 53% of respondents had started or grown a blog with SEO goals. 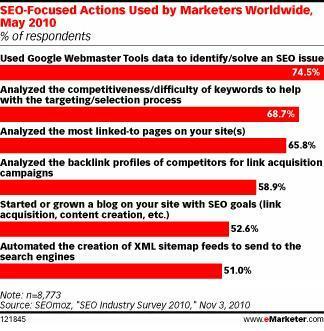 Search marketers are using blogging as a way to improve their SEO. These are the folks most versed in the ways to improve content visibility on the web across multiple channels. Blogging continues to be a proven way for businesses and individuals to improve content visibility while improving site traffic and sales leads. Blogging regular articles and posts can lead to relevant search traffic. An increasing number of people are reading blogs. People are searching the Web for interpretation, insight, and answers to their questions of all kinds. It’s important for your company to form a blogging strategy and implement a blog to take advantage of the opportunity. Do you still have questions about why your company should blog? Share your concerns in the comments.